One of the best scents you’ll ever experience in life is a new car smell. That’s why rappers brag about it when glorifying their personal achievements. Owning a new car gives you a sense of achievement because you’re the first owner in the entire world! However, when expectations meet reality, car buyers have one question. Should I Buy or Lease a New Car? When expectations meet reality, car buyers have one question. Should I Buy or Lease a New Car? 1. What are the advantages of buying a car? 2. Are there disadvantages to buying a car? 3. What are the pros of leasing a new car? 4. Are there disadvantages of leasing a car? 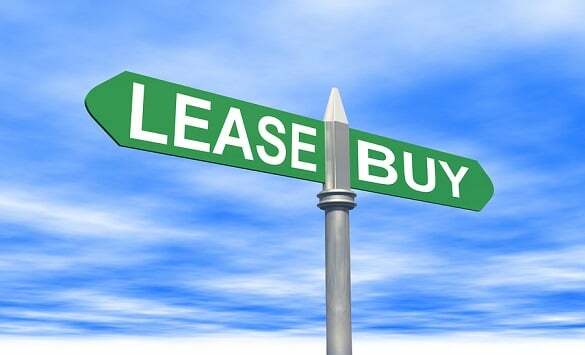 5.Is it better to buy or lease a car? Buying a car whether by applying for an auto loan or paying cash gives you full ownership rights. These rights enable you to change colors and install car accessories whenever you want. You can also confidently list your motor vehicle as collateral when applying for bank loans. If you have a son or daughter who’s about to join college, all you need to do is drive to the DMV and request for a car title transfer. Car dealerships usually lease the latest models because they generate more profit compared to cars that have been around for more than three years. Truth is, not everybody likes the latest models. Some people enjoy driving classics that dominated the 60’s and 70’s. Since it’s almost impossible to find a car dealership that leases these old school vehicles, you’d rather save for a cash purchase. Employees hired on a permanent basis get to enjoy low-interest car loans. A staff car loan has low cash deposit requirements and you don’t have to deposit any collateral. Your employer simply deducts installments before depositing your net salary in your bank account. No matter how profitable a corporate organization is, you’ll never see them offering car leases to its employees. Why? Because leases are very expensive and in the end, you don’t own the car. Car dealers understand that middle-class citizens usually save up for 6-12 months in order to buy cars. Saving money for a new car requires a lot of discipline because one has to frequently overcome the temptation to spend the money on other needs and wants. However, not everyone can follow this path due to different financial situations. A college student most likely cannot afford a brand new car because his part-time jobs pay modestly. Read: New or Used: Which Car is Right for Me? Car dealerships offer subprime auto loans to people with credit scores ranging from 550-620. You can also get a bad credit auto loan if your credit score is 500 or less, however, you won’t like the terms. Nine out of ten car dealerships will limit your choices to the used-cars section. As far as subprime auto loan interests go, there’s nothing to smile about. A car buyer with an excellent credit score of 720 pays 4% while another one with a score of 500 pays 16%. Leasing is an ideal option if you currently drive a 2016 BMW but have plans of upgrading to a better car from the same auto manufacturer. Car dealerships understand how brand loyalty plays a significant role in influencing buying decisions among car buyers. Leasing allows you to drive the newest models at a really low cost because dealerships require 20 % upfront. In car leasing agreements, customers pay 20 % upfront to receive the car. Paying 20% for a high-end SUV is more affordable than saving a 40-50 % down payment. It will take you probably 2-3 months to save for your car lease down payment and you can say goodbye to public transport. International and multinational companies usually transfer employees from one country to another. If your employer posts you to a foreign country for less than two years, then leasing a car makes more financial sense than buying. Why? Because auto loan installments for a short repayment period are costly compared to lease payments. Car dealerships offer leases to premium customers due to two important reasons. Premium customers have excellent credit scores because they have amazing debt payment track records with several banks, credit card companies, and real estate agents. Second, high-end customers have huge net incomes that allow them to make expensive monthly payments without breaking a sweat. If you have a subprime credit rating, you’ll waste a lot of time convincing car dealerships to offer you a lease. Most car owners hate leases because one has to adhere to a strict set of rules. One of this is keeping your mileage below the annual maximum limit. Car dealerships impose this rule in order to retain the leased car in excellent shape for repossession. If a customer skips two consecutive payments, the car dealership can still resell the car at a good value. Car dealerships that offer leases expect customers to get their own auto insurance covers. Since car dealerships only offer leases to high-end cars, you end up paying expensive auto insurance quotes. In fact, the dealership expects you to get a comprehensive auto insurance cover. If you’re planning to own a car for a long time, buying a car is the best option. When you have full ownership rights over your car, you can plan long road trips without worrying about excess mileage penalties. You also have the freedom to install car accessories, unlike a lease customer who can only enjoy this freedom after buying the leased car. Applying for an auto loan will directly improve your credit score when you pay all your installments on time.